I started thinking about Thor 2 which I watched a few days ago and was surprised to realize that I never doubted the special effects that I sat through. Usually when you watch these super hero flicks your mind will pick up on things that don't look real (realistic), which will break your mind away from the spell (focus) contrived by the hundreds or even thousands of people who work on these flicks. This 'spell' is known as the suspension of disbelief. The suspension of disbelief has been steadily stretched by the introduction of computerized special effects. In the past, there are only a few films that managed to attain this most sought after quality without the extensive aid of computers -films like Star Wars, Superman (1977), and 2001: A Space Odyssey come to mind. And that was done through very laborous processes such as model building and careful lighting, selective camera angles, and ponderous filming techniques. But all of that went straight out the window when faster processing and affordable computers came along. And since even that occured more than 30 years ago the level of realism in special effects is quite astounding currently-so amazing that they may be in danger of being thought of as being taken for granted. But this is what filmmakers actually hope for! Why? Because when you take a thing for granted it also means you fail to notice it sometimes-and the best special effect is the one you don't notice! 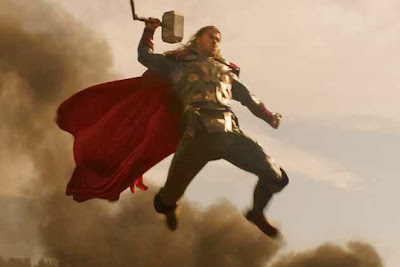 So as I watched Thor 2 I never really thought about the special effects- they properly fell into the background of the pretty decent narrative that was woven by the filmmakers. There wasn't a moment in it where I consciously said to myself, "Aha! That looks fake!" or as sometimes is the case FEELS fake. No, this film was pretty darn fun and exciting to look at and listen to --and it's about time; considering the cost of watching a movie nowadays. With this movie I got my money's worth.